A built-in audio device poses trivia questions in Obsessed With Star Trek. 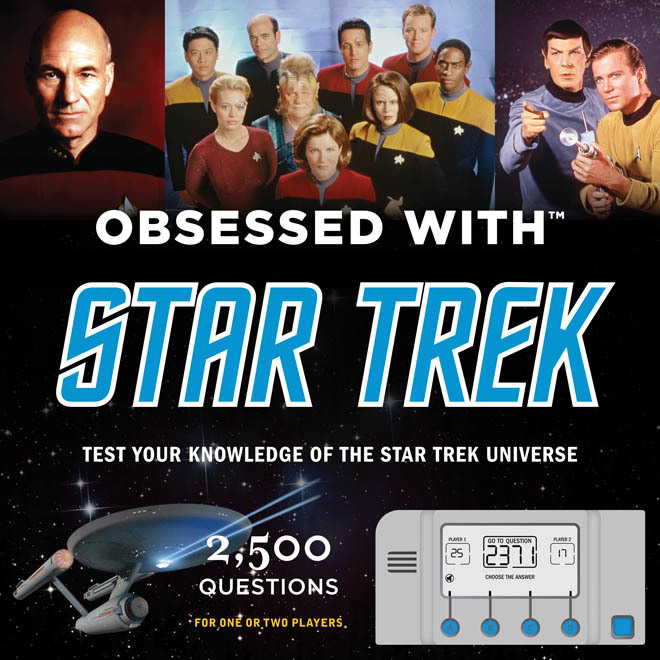 Calling all Trekkies: A new book embedded with an audio module poses 2,500 trivia challenges designed to test even the most devoted Star Trek know-it-all. Compiled by Chip Carter, the 320-page Obsessed With Star Trek organizes minutiae gleaned from Star Trek creator Gene Rodenberry’s sci-fi television and movie empire. To answer multiple-choice questions printed on its pages, readers use a button-operated device that indicates correct and incorrect responses with ringtones and an LED screen. Wired.com is teaming with publisher Chronicle Books to give away one free copy of Obsessed With Star Trek (retail priced at $30). To qualify for the contest, correctly answer at least one of the Obsessed questions below. Enter your answers in the comments section. 1. What house did Klingon sisters Lursa and B’Etor belong to? 2. What was the Jem’Hadar battle chant? 3. Which well-known royal figure had a nonspeaking cameo in “Investigations”? Deadline to enter is 12:01 a.m. Pacific on Oct. 11, 2011. One randomly selected winner will be notified by e-mail or Twitter. Winner must live in the United States. Note: If you do not have an e-mail address or Twitter handle associated with your Disqus login, you must include contact information in your comment to be eligible. Any winner who does not respond to Wired’s notification within 72 hours will forfeit the prize.